Two hugely iconic and influential new wave acts, one unforgettable show! 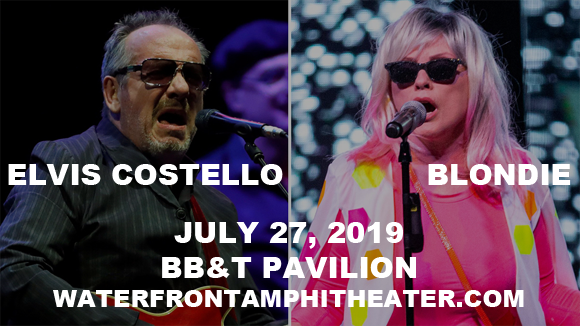 Elvis Costello & Blondie comes will be performing at BB&T Pavilion on Saturday 27th July 2019 as part of their co-headlining Blondie and the Beastly E.C.! tour! Costello and Blondie lead singer Debbie Harry previously collaborated together in 1997 on a Jazz Passengers track, and now the veteran performers will share the stage again for a mind-blowing double bill! English musician, singer, songwriter, composer, record producer, author, television presenter, and actor Elvis Costello is known for his intelligent lyrics and punk rock sensibilities, and has had a plethora of hits throughout his five decade career, including his 1979 hit "Oliver's Army". A multi-award-winner, including a Grammy Hall of Fame Award, Costello is also known for his ecletic and high-profile collaborations with notable artists including Paul McCartney, Madness, Tony Bennett, Burt Bacharach, Allen Toussaint, T Bone Burnett, Lucinda Williams, Johnny Cash, Kid Rock, Lee Konitz, Brian Eno, and Rubén Blades. In 2003, Costello and his former band, the Attractions, were inducted into the Rock and Roll Hall of Fame, and in 2004 he was ranked by Rolling Stone as number 80 on their list of the 100 Greatest Artists of All Time.